For the modern country, see State of Israel. 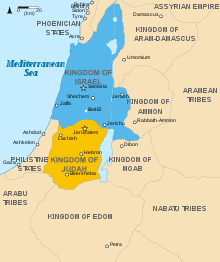 For the two split kingdoms, see Kingdom of Israel (Samaria) and Kingdom of Judah. The United Monarchy (Hebrew: הממלכה המאוחדת) is the name given to the Israelite[note 1] kingdom of Israel and Judah, during the reigns of Saul, David and Solomon, as depicted in the Hebrew Bible. This is traditionally dated between 1050 BCE and 930 BCE. On the succession of Solomon's son, Rehoboam, around 930 BCE, the biblical account reports that the country split into two kingdoms: the Kingdom of Israel (including the cities of Shechem and Samaria) in the north and the Kingdom of Judah (containing Jerusalem) in the south. According to standard source criticism, a number of distinct source texts were spliced together to produce the current Books of Samuel. The most prominent in the early parts of the first book are the pro-monarchical source and the anti-monarchical source. In identifying these two sources, two separate accounts can be reconstructed. The anti-monarchical source describes Samuel as having thoroughly routed the Philistines, yet begrudgingly accepting the people's demand for a ruler, subsequently appointing Saul by cleromancy. The pro-monarchical source describes the divinely appointed birth of Saul (a single word being changed by a later editor so that it referred to Samuel instead), and his leading of an army to victory over the Ammonites, resulted in the clamouring of the people for him to lead them against the Philistines, whereupon he is appointed king. Textual critics also point to disparities in the account of David's rise to power as indicative of separate threads being merged later to create a Golden Age of a united monarchy. David is thought by scholars to have been a ruler in Judah, while Israel, comparatively immense and highly developed, continued unfettered. Modern archaeology also supports this view. Most scholars believe the Books of Samuel exhibit too many anachronisms to have been a contemporary account. For example, there is mention of later armor (1 Samuel 17:4–7, 38–39; 25:13), use of camels (1 Samuel 30:17), cavalry (as distinct from chariotry) (1 Samuel 13:5, 2 Samuel 1:6), and iron picks and axes (as though they were common) (2 Samuel 12:31). The historicity of the conquest described in the Book of Samuel is not attested, and many scholars regard this conquest as legendary in origin, particularly given the lack of evidence for the battles described involving the destruction of the Canaanite peoples. Most scholars believe that Samuel was compiled in the 8th century BCE (rather than the 10th century when most of the events described take place) based on both historical and legendary sources, primarily serving to fill the gap in Israelite history after the events described in Deuteronomy. This gap in the historical record is characteristic of the Late Bronze Age collapse; cultural memories of times before the disaster often became embellished as stories of a "lost golden age", as in the Trojan Epic Cycle. According to Israel Finkelstein and Neil Silberman, authors of The Bible Unearthed, ideas of a united monarchy are not accurate history but rather "creative expressions of a powerful religious reform movement," possibly "based on certain historical kernels." Finkelstein and Silberman do accept that David and Solomon were real kings of Judah about the 10th century BCE, but they cite the fact that the earliest independent reference to the Kingdom of Israel dates to about 890 BCE, while that for the kingdom of Judah dates to about 750 BCE. This is supported by Jonathan Tubb, who argues that the story of the united monarchy was fabricated as a Golden Age tale during the Exile. He accepts the historicity of David and Solomon but cautions that "[t]hey must be seen . . . as local folk heroes and not as rulers of international status." Oded Lipschits wrote in the Jewish Study Bible that "the premonarchic period long ago became a literary description of the mythological roots, the early beginnings of the nation and the way to describe the right of Israel on its land. The archeological evidence also does not support the existence of a united monarchy under David and Solomon as described in the Bible, so the rubric of "united monarchy" is best abandoned, although it remains useful for discussing how the Bible views the Israelite past". On the other hand, while Amélie Kuhrt does acknowledge that "there are no royal inscriptions from the time of the united monarchy (indeed very little written material altogether), and not a single contemporary reference to either David or Solomon," she concludes that "[a]gainst this must be set the evidence for substantial development and growth at several sites, which is plausibly related to the tenth century." Kenneth Kitchen reaches a similar conclusion, arguing that "the physical archaeology of tenth-century Canaan is consistent with the former existence of a unified state on its terrain." Aerial view of Khirbet Qeiyafa. Excavations at Khirbet Qeiyafa, an Iron Age site located in Judah, found an urbanized settlement radiocarbon dated well before scholars such as Finklestein suggest urbanization began in Judah, supporting existence of a Judahite kingdom. The Israel Antiquities Authority stated: "The excavations at Khirbat Qeiyafa clearly reveal an urban society that existed in Judah already in the late eleventh century BCE. It can no longer be argued that the Kingdom of Judah developed only in the late eighth century BCE or at some other later date." The techniques and interpretations used to reach some conclusions related to Khirbet Qeiyafa have been criticized by some scholars, among them Finkelstein and Alexander Fantalkin of Tel Aviv University. In August 2015, Israeli archaeologists discovered massive fortifications in the ruins of the ancient city of Gath, supposed birthplace of Goliath. The size of the fortifications show Gath to have been a very large city in the 10th century BCE, perhaps the largest in Canaan at the time. The professor leading the dig, Aren Maeir, estimated that Gath was as much as four times the size of contemporary Jerusalem, casting doubt that David's kingdom could have been as powerful as described in the Bible. According to the Book of Judges, before the rise of the united monarchy the Israelite tribes lived as a confederation under ad hoc charismatic leaders called judges. Abimelech the first judge to be declared king by the men of Shechem and the house of Millo, reigned over Israel for three years before he was killed during the Battle of Thebez. According to the biblical account, the united monarchy was formed when there was a large popular expression in favour of introducing a king to rule over the decentralised Israelite confederacy. Increasing pressure from the Philistines and other neighboring peoples is said by the Bible to have forced the Israelites to unite as state following the anointing of Saul by Samuel. The Bible treats the notion of kingship as having been anathema, it being viewed as the placing of one man in a position of reverence and power that ought to be reserved for God. David and Saul become bitter enemies, at least from Saul's point of view, although sources describe Jonathan, Saul's son, and Michal, Saul's daughter, as assisting David to escape Saul, ultimately leading to a brief reconciliation before Saul's death. According to the Second Book of Samuel, Saul's disobedience prompts God to curtail his reign and hand his kingdom over to another dynasty. Saul dies in battle against the Philistines after a reign of just two years. His heir, Ishbaal, rules for only two years before being assassinated. David, heretofore king of Judah only, ends the conspiracy and is appointed king of Israel in Ishbaal's place. Some textual critics and biblical scholars suggest that David was actually responsible for the assassination and that David's innocence was a later invention to legitimize his actions. Israel rebels against David and appoints David's son Absalom king, forcing David into exile east of the Jordan. David eventually launches a successful counterattack that results in the loss of Absalom. Having retaken Judah and asserted control over Israel, David returns west of the Jordan. Throughout the remainder of his reign, he continues to suppress rebellions that arise among the people of Israel. This section of the biblical text, and the bulk of the remainder of the Books of Samuel, is thought by textual critics to belong to a single large source known as the Court History of David. Although reflecting the political bias of the kingdom of Judah following the destruction of Israel, the source remains somewhat more neutral than the pro- and antimonarchical sources comprising earlier parts of the text. Israel and Judah are portrayed in this source as quite distinct kingdoms. Prior to the ascension of Saul, the city of Shiloh is seen as the national capital, at least in the religious sense, a claim that from an archaeological standpoint is considered plausible. Throughout the monarchy of Saul, the capital is located in Gibeah. After Saul's death, Ishbaal rules over the kingdom of Israel from Mahanaim, while David establishes the capital of the kingdom of Judah in Hebron. Following the civil war with Saul, David forges a strong and unified Israelite monarchy, reigning c. 1000 to 961 BCE and establishing Jerusalem as his national capital in 1006 BCE. Some modern archaeologists, however, believe that the two distinct cultures and geographic entities of Judah and Israel continued uninterrupted, and that if a political union between them did exist, it possibly had no practical effect on their relationship. In the biblical account, David embarks on successful military campaigns against the enemies of Judah and Israel, defeating such regional entities as the Philistines to secure his borders. Israel grows from kingdom to empire, its sphere of influence—militarily and politically—expanding to control the weaker client states of Philistia, Moab, Edom and Ammon, with Aramaean city-states Aram-Zobah and Aram-Damascus becoming vassal states. [unreliable source?] The imperial border is described as stretching from the Mediterranean Sea to the Arabian Desert, from the Red Sea to the Euphrates River. Some modern archaeologists believe that the area under the control of Judah and Israel, excluding the Phoenician territories on the shore of the Mediterranean, did not exceed 34,000 square kilometres (13,000 sq mi), of which the kingdom of Israel encompassed about 24,000 square kilometres (9,300 sq mi). David is succeeded by his son Solomon, who obtains the throne in a somewhat disreputable manner from rival claimant Adonijah, his elder brother. The reign of Solomon (c. 961 to 922 BCE) proves to be a period of unprecedented peace, prosperity, and cultural development. Solomon embarks on an aggressive campaign of public building, erecting the First Temple in Jerusalem with assistance from the King of Tyre, with whom he has maintained the strong alliance forged by his father. Like the palace of David, Solomon's temple is designed and built with the assistance of Tyrian architects, master craftsmen, skilled labourers, money, jewels, cedar, and other goods obtained in exchange for land ceded to Tyre. Solomon goes on to rebuild numerous major cities, including Megiddo, Hazor, and Gezer. Some scholars have attributed aspects of archaeological remains excavated from this sites, including six-chambered gates and ashlar palaces, to this building programme. However, excavation teams at Meggido later established that these structures are from different time periods. Yigael Yadin subsequently concluded that the stables once believed to have served Solomon's vast collection of horses were actually built by King Ahab in the 9th century BCE. Map showing the Kingdoms of Israel (blue) and Judah (orange), ancient Southern Levant borders and ancient cities such as Urmomium and Jerash. The map shows the region in the 9th century BCE. Following Solomon's death in c. 926 BCE, tensions between the northern part of Israel containing the ten northern tribes, and the southern section dominated by Jerusalem and the southern tribes reached boiling point. When Solomon's successor Rehoboam dealt tactlessly with economic complaints of the northern tribes, in about 930 BCE (there are differences of opinion as to the actual year) the United Kingdom of Israel and Judah split into two kingdoms: the northern Kingdom of Israel, which included the cities of Shechem and Samaria, and the southern Kingdom of Judah, which contained Jerusalem, with most of the non-Israelite provinces achieving independence. The Kingdom of Israel (or Northern Kingdom, or Samaria) existed as an independent state until 722 BCE when it was conquered by the Assyrian Empire, while the Kingdom of Judah (or Southern Kingdom) existed as an independent state until 586 BCE when it was conquered by the Neo-Babylonian Empire. Many alternative chronologies have been suggested, and there is no ultimate consensus between the different factions and scholarly disciplines concerned with this period, as to when it is depicted as having begun or when it ended. Most bibical scholars follow either of the older chronologies established by William F. Albright or Edwin R. Thiele, or the newer chronology of Gershon Galil, all of which are shown below. All dates are BCE. Thiele's chronology generally corresponds with Galil's chronology below with a difference of at most one year. ^ Werblowsky, R.J. Zwi; Wigoder, Geoffrey, eds. (1966). "Israelite". The Encyclopedia of the Jewish Religion. Holt, Rinehart and Winston. pp. 206–207. ^ Cundall, Arthur E. (1973). "The United Monarchy: fact or fiction?" (PDF). Vox Evangelica. 8: 33–39. ^ Harvey, Graham (1996). The True Israel: Uses of the Names Jew, Hebrew, and Israel in Ancient Jewish and Early Christian Literature. Boston: Brill Academic Publishers, Inc. p. 164. ISBN 0-391-04119-3. ^ de Vaux, O.P., Roland (1997). Ancient Israel: Its Life and Institutions. Translated by McHugh, John. Grand Rapids, Michigan: Wm. B. Eerdmans Publishing. ISBN 0-8028-4278-X. ^ a b Lipschits, Oded (2014). "The history of Israel in the biblical period". In Berlin, Adele; Brettler, Marc Zvi. The Jewish Study Bible (2nd ed.). Oxford University Press. ISBN 978-0-19-997846-5. ^ a b c d Finkelstein, Israel; Silberman, Neil Asher (2001). The Bible Unearthed: Archaeology's New Vision of Ancient Israel and the Origin of its Stories. New York: Simon & Schuster. ISBN 0-684-86912-8. ^ a b Kuhrt, Amélie (1995). The Ancient Near East, c. 3000-330 BC, Band 1. New York: Routledge. p. 438. ISBN 978-0-41516-762-8. ^ Jones, Gwilym H. (2001). "1 and 2 Samuel". In Barton, John; Muddiman, John. The Oxford Bible Commentary. Oxford University Press. pp. 197–199. ISBN 978-0-19875-500-5. ^ Killebrew, Ann E. (30 December 2016). Aruz, Joan; Seymour, Michael, eds. Assyria to Iberia: Art and Culture in the Iron Age. Metropolitan Museum of Art. pp. 30–38. ISBN 978-1-58839-606-8. ^ Cf. Kalimi, Isaac (29 November 2018). Writing and Rewriting the Story of Solomon in Ancient Israel. Cambridge University Press. pp. 47–48. ISBN 978-1-108-58837-9. ^ Finkelstein, Israel; Silberman, Neil Asher (2007). David and Solomon: In Search of the Bible's Sacred Kings and the Roots of the Western Tradition. New York: Simon and Schuster. p. 20. ISBN 978-1-416-55688-6. ^ Tubb, Jonathan (2006). Canaanites. London: The British Museum Press. p. 115. ISBN 0-7141-2766-3. ^ Kitchen, Kenneth (2003). On the Reliability of the Old Testament. Grand Rapids, Michigan: William B. Eerdmans Publishing Company. p. 158. ISBN 978-0-80280-396-2. ^ Garfinkel, Yossi; Ganor, Sa'ar; Hasel, Michael (19 April 2012). "Journal 124: Khirbat Qeiyafa preliminary report". Hadashot Arkheologiyot: Excavations and Surveys in Israel. Israel Antiquities Authority. Archived from the original on 1 January 2018. Retrieved 12 June 2018. ^ Finkelstein, Israel; Fantalkin, Alexander (May 2012). "Khirbet Qeiyafa: an unsensational archaeological and historical interpretation" (PDF). Tel Aviv. 39: 38–63. doi:10.1179/033443512x13226621280507. Retrieved 12 June 2018. ^ Hasson, Nir (4 August 2015). "Philistine city of Gath a lot more powerful than thought, archaeologists suggest". Haaretz. Haaretz Daily Newspaper Ltd. Retrieved 12 June 2018. ^ Lemaire, Andre. "King Saul." Archived 2014-05-27 at the Wayback Machine My Jewish Learning. 27 May 2014. ^ Stanley Jerome Isser (January 2003). The Sword of Goliath: David in Heroic Literature. BRILL. pp. 152–. ISBN 90-04-12737-2. ^ "The Jewish temples: Jerusalem in the First Temple Period (1006–586 BCE)". Jewish Virtual Library. American-Israeli Cooperative Enterprise. Retrieved 14 June 2018. ^ Finkelstein, Israel; Maza, Amihay (2007). The Quest for the Historical Israel. Atlanta: Society of Biblical Literature. p. 102. ISBN 978-1-58983-277-0. ^ Shanks, Hershel (2010). Ancient Israel (3rd Edition). Pearson. ISBN 0205096433. ^ Friedman, Richard (1987). Who Wrote The Bible. HarperOne. ISBN 0060630353. ^ Bloom, Harold (2004). The Book of J. Grove Press. ISBN 0802141919. Davies, Philip (2010). "Urban Religion and Rural Religion". In Stavrakopoulou, Francesca; Barton, John. Religious Diversity in Ancient Israel and Judah. A&C Black. Dever, William G. (2017). Beyond the Texts: An Archaeological Portrait of Ancient Israel and Judah. SBL Press. ISBN 9780884142171. Hjelm, Ingrid; Thompson, Thomas L. (2016). "Introduction". In Hjelm, Ingrid; Thompson, Thomas L. History, Archaeology and The Bible Forty Years After "Historicity". Routledge.